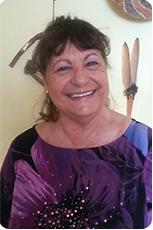 Kathy Bastien has been an energy healer for 17 years, beginning with Reiki and then adding many other modalities to her work, especially shamanic healing. Her studies and work have taken her to New York, Massachusetts, Connecticut, Florida and now, New Mexico. The foundation of Kathy's shamanic healing training was taught by Sandra Ingerman at the Omega Institute in New York, but Kathy has also trained intensively with Shamans of Ecuador who use very different, but very effective, methods. Kathy's special shamanic training took her to Ecuador and into the Amazon Jungle where she was taught by Shaman's Don Esteban and his son Jorge, Maria Juana of the Otavalo section of Ecuador, Don Augastin of the Amazonian Jungle, and Don Alberto Taxo of Saraguru from the South of Ecuador. Kathy continually upgrades her skills with the hope and dream of healing - healing herself and others through the path of the Light and the Heart of the Shaman.